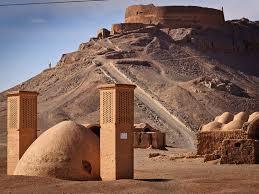 Tower of Silence (Zoroastrians‘ Dakhmeh) is a tower that has been built on the top of a hill, considered as place where Zoroastrian‘s left their dead. Until 40 years ago, corpses could still be found on top of the Towers of Silence in Yazd, Iran, slowly disintegrating or being picked apart by desert vultures. In the Zoroastrian tradition, once a body ceases to live, it can immediately be contaminated by demons and made impure. To prevent this infiltration, Zoroastrians purified the dead body by exposing it to the elements and local fowl on top of flat-topped towers in the desert called dakhmas. According to a tradition dating back over 3,000 years, bodies were arranged on the towers in three concentric circles. Men were placed in the outer circle, women in the middle, and children in the inner-most ring. Bodies were then left until their bones were bleached by the elements and stripped by the vultures. After the process of purification, bones were placed in ossuaries near, or inside, of the towers. Ossuaries from these rituals have been discovered from the 4th and 5th century BCE. Similar 12 dakhmas exist just outside of Mumbai, India, as well, although the most prominent ―Towers of Silence‖ are in Iran. As Iran developed and urbanized, dakhmas became increasingly closer to city limits, severely curtailing their use. Since the 1970s, the use of dakhmas has been illegal in Iran, forcing orthodox Zoroastrian‘s to adapt to new burial methods. Many in the Zoroastrian community have moved to burying bodies beneath concrete, to keep out all contaminants. Although the towers are no longer used in ceremony, they can be visited along with a number of the ossuaries in the area.